We finally can offer you these high fashion, price conscious blouses. They are just right for cocktail waitresses, Maitre D's and waitresses. Color selection is fantastic. Dressing for success is simple with the Ladies Server Long Sleeve Cowl-Neck Cocktail Blouse from Sharper Uniforms. This sophisticated, classic design will look simply elegant on wait staff in chic restaurant. The apparel of the staff from the waitress on up add to the upscale ambiance that will have your establishment listed in the top ten places to dine. The stylish cut of the long sleeve cocktail blouse is even ideal for a front desk hotel staff. Its professional appeal is the perfect touch of refinement. Choose from a demur array of tasteful colors that will pair well with slacks or skirts. 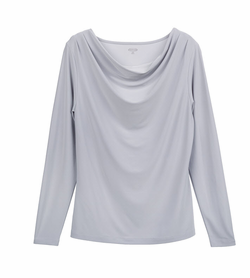 Your staff will love the tasteful feel of the blouse that can easily work solo or with a layered style. Add a smart jacket for the cooler months. Love the cosmopolitan appeal of the wardrobe choices from Sharper Uniforms. Make your workplace uniform more than just a work shirt.